Some of my favorite bloggers are posting quite a bit about predators harming their chickens. I am familiar with this malady, as it took us six years to keep a clutch of chickens from harm’s way. The barn hosted another entirely different set of circumstances, which we did not know about until our first clutch of chickens were nearly mature. We didn’t know about these predators because they were primarily of the nocturnal species of wildlife that you only read about, never really seeing them too much. These included opossums, raccoons, bats, coyote, rats and weasels. Five of the six listed here are threats to chickens. And these critters had at a feast every year for six years, despite my attempts at trying to fool, cage proof, catch and remove them. One year, I even tried keeping our chicks in a pigeon coop on the second story of our tractor shed. I climbed a ladder everyday, making several trips with water, feed and poultry litter. This was done in vain, because it was one hot July morning that I climbed that ladder only to find lots of dead chickens. Apparently a few raccoons figured out how to get into the top of the tractor shed and wasted the entire group of them. It was horribly sad, and a real mess to deal with. That was the last of the chicken massacres via wildlife predators. That was also after we moved larger livestock into the barn, and decided to feed our chickens near the bigger animals. These bigger animals were our goats. We spent a considerable amount of time catching and removing the wild animals from the barn, and we moved and cleaned up many habitats they were apparently residing. We acquired some adult Araucana hens and roosters. We let them free range. They took roost in trees, high barn lofts and along the stalls of the goats. Araucana Americana or Easter egg chickens are not the same, but very similar. Ours are probably not pure breed, that doesn’t matter to me because they are alive and thriving. They have survival instincts far surpassing many other domestic varieties. They can jump and fly rather well. They can run fast. The hens make great mothers. They do not, however lay many eggs in the winter, I have addressed this by introducing other domestic breeds slowly and a little at a time. I trade fertile eggs with other farmers and allow our hens to hatch them, and our hens protect their peeps fiercely. The first winter we had our Araucana chickens, a peacock showed up and roosted with the chickens. This was not only very strange, but entertaining and a fine conversation piece. He came in with a bunch of wild turkeys in the hay fields. I spotted him in the fields a few times wondering “What in the world is that?” About two weeks after my first sighting of him, he decided to live with us for the winter. He roosted in the trees too, and ate with the chickens, squawked when someone came to our house, and strutted his stuff for the hens. When spring returned, so did the turkeys, and our peacock guest left the same way he came, with the turkeys. If you can’t beat wildlife, join it and try a wilder breed of stock to begin with. Having our chickens in a cage or pen only kept our chickens confined to make it easy for predators to catch. Once the predators know they can eat, they will return and find a way to their next meal. Having diversity throughout the operation can serve many purposes, like having larger animals close by as a deterrent to predators. Our first goats here had their horns. I don’t recommend horned goats, and prefer dis-budded goats, but they were able to defend themselves for the first few years and no major injuries occurred to the goats. These Color Range peeps are a heritage breed chicken that we received on Friday. If I were to show my youngest son these chicks, we’d be chicken-goners, and we’re still just a few months show of being ready to jump into having chickens on our land! So I’ll have to keep this great little post to myself for now. Your hard-won experience is much appreciated ‘over here’. Thanks for the comment, it’s been a long time since we’ve had troubles, I hope it stays that way! 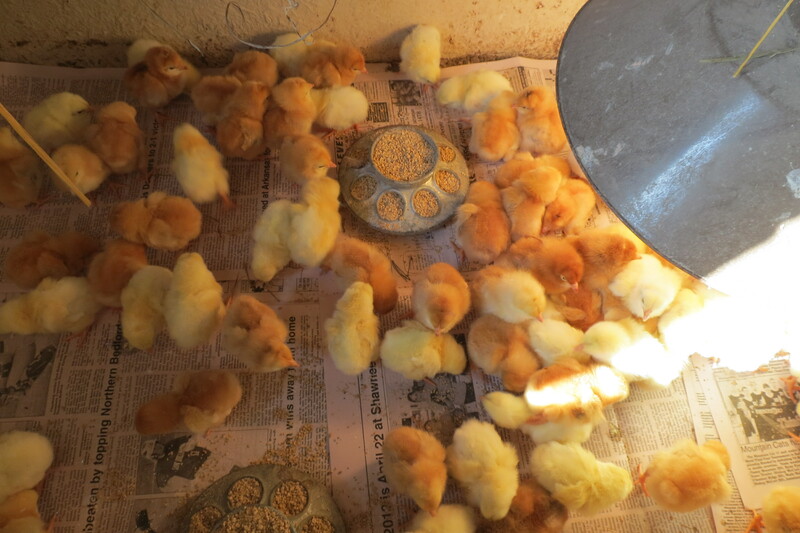 Thanks for your thoughts on raising chicks… have you had any problems on chick-on-chick violence? Do you get chicks that are already sexed? By the way, we have adult aracaunas too though I don’t know if they’re the Americana variety or not, and they are really great chickens! No, I do not have problems with chick on chick violence, and our chickens are not sexed either. Most of our peeps are hatched here. I did order a heritage breed variety to try. They are not sexed either, and seem to be getting along with each other. I would like to help preserve genetic diversity, and these peeps are supposed to be great free range breed. I’ll let you know how it goes. This post provides a very interesting insight into farming! I appreciate your dedication to free range raising of your chickens and to organic farming. And, do you wonder where in the world that peacock came from??! I asked everyone I ran into if they were missing a peacock. People just looked at me as if I were a little off, I never found who he belonged to. And then he just wandered away one day…?! That seemed to be his style. I had sighted him a few times in the fields with the turkeys after he left. I would say that after a couple of months from his stay here, I never saw him again. I hope he left a lovely feather at least, as a souvenir (or proof 🙂 )! A few feathers were a gift for our hospitality!